At its heart Only the Few is a tale of courage and fortitude in the face of seemingly insurmountable, horrifying challenges. Set in an England laid waste by bombs and peopled with scattered bands of survivors, ruthless scavengers, as well as nightmarish science-experiment rejects referred to as ‘cavers,’ this post-apocalyptic dystopian story follows the travails of Corporal Catherine Hyde. After losing her entire family to the bombing which felled England, she and a small military force are sent out on a recon and rescue mission, seeking to rescue surviving humans the English countryside. 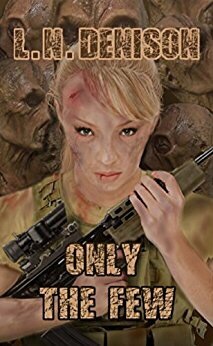 After losing her whole squad to an attack by the cannibalistic cavers, she must face the daunting prospect of trekking back to the relative safety of her London barracks by foot, with little more than a lone gun and her own wits to protect her. Along the way she encounters many obstacles, a few friends, and many enemies… culminating in a shocking twist at the end that will leave you staring dumbstruck at the page wondering how you could have missed the signs. Bravo! I haven’t read many books in this genre, but I found Only the Few difficult to put down. Admittedly, we know very little about Hyde’s past, her character outside the military, but we are given snippets and these only serve to deepen the intrigue surrounding her. I, for one, appreciated that while Hyde is tough as nails, she is still sometimes weakened by insecurities. At one point, late in the book, as Hyde contemplates a possible romantic attachment, she inspects her naked, bruised and battered body wondering “Would (he) ever find me attractive if he saw the real me?” I found her insecurities refreshing and relatable, much more so than if Hyde were simply an unflappable, tough-as-nails heroine utterly certain of herself and her abilities. I’ll admit, while horrifying in their actions and origins, the cavers completely captured my attention. I would’ve enjoyed more if them in this story, truth be told. The aforementioned twist at the end practically guarantees another installment and I will be eagerly awaiting the next chapter on Corporal Hyde’s journey. Available in Kindle Unlimited, you can check out Only the Few for yourself HERE. Probably not my type of book, but it sounds like anyone who enjoys this genre will love it. Great review.